and ensuring a safe work environment. Lawrence Brunoli, Inc. knows that a well-managed project results in a high-quality product and client satisfaction. We utilize construction management software along with our experience and knowledge to efficiently control project activities. 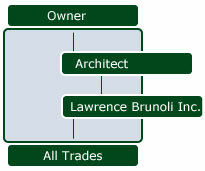 Lawrence Brunoli, Inc. also contains a nucleus of highly skilled and experienced subcontractors, always mindful that who we employ is a direct reflection on our company. We maintain a good relationship with all subcontractors we have found to be exceptional in the past so that when called upon again they will perform to their expected abilities.